HEAR MY VOICE is a cinematic tribute to those who suffered loss as a result of the Northern Irish conflict (1968-1998). Timed to mark the 20th anniversary of the Good Friday agreement that brought violence to an end, the film is based on artist Colin Davidson’s elegiac exhibition of paintings, Silent Testimony. When Davidson began working on his signature, large-scale portraits, he became increasingly preoccupied, not with the celebrity of his sitters, but more with their status as human beings; what he describes as their 'common humanity'. Each of the portrait sitters is linked by profound loss, with their own unique story to tell. Their ‘common humanity’ is captured in the haunted but understated expression each of them shares. The sheer scale and detail of the portraits allows for close examination of the lines, brush strokes and layers of paint that make up the subjects’ faces, their eyes and expressions saying so much more than any TV interview could convey; horror and dignity etched in equal measure. We cut between elegant tracks of each of the paintings, both floating into and retreating from the artworks. We can see the curved lines between the brush strokes, craters between the paint where our audience can contemplate the tragic nuances behind the unfolding stories. HEAR MY VOICE breathes cinematic life into the stories of the people featured in the Silent Testimony paintings and is centred around a special hanging of the exhibition in a former ironworks building in Belfast City Centre, Riddel Warehouse. Complemented by an original classical score by composer Brian Byrne, the beautiful cinematography of Richard Kendrick and the skilful editing of Greg Darby, HEAR MY VOICE becomes a poetic testament to the resilience of Northern Ireland’s forgotten victims and a cri de coeur for an Ireland free of armed conflict. Hear My Voice had it’s Gala Premiere at the Queen’s Film Theatre on Wednesday the 11th of April 2018. Colin is a contemporary artist, living and working near Belfast, Northern Ireland. Since graduating in 1991 from the University of Ulster with a first-class honours degree, he has structured his practice in themes, and since 2010 his focus has been on painting grand scale portraits, which have won widespread recognition and many international awards. As well as numerous commissions, Davidson's portrait sitters have included Brad Pitt, Ed Sheeran, Liam Neeson, Brian Friel, Sir Kenneth Branagh, Dame Mary Peters, Gary Lightbody, Marketa Irglova, Glen Hansard, Mark Knopfler and Seamus Heaney. His work is held in many public and corporate collections worldwide, including Queen's University Belfast, the Ulster Museum (Belfast), Standard Life (London), the National Gallery of Ireland (Dublin), the Standard Chartered Bank of Asia, the Smithsonian National Portrait Gallery (Washington DC) and the National Portrait Gallery, (London). Davidson's recent exhibition of portrait paintings, entitled 'Silent Testimony', reveals the stories of eighteen people who are connected by their individual experiences of loss through the Troubles - a turbulent 30-year period in Northern Ireland from the late 1960s onwards. This critically acclaimed body of work was on show at the Ulster Museum Belfast during 2015, before embarking on a tour which included the Centre Culturel Irlandais in Paris and Dublin Castle. In December 2015 he was commissioned by TIME Magazine to paint the German Chancellor, Angela Merkel, for the cover for its 'Person of the Year’ issue. In 2016 Colin Davidson was invited to paint an official portrait of HM Queen Elizabeth II, which was unveiled later that year. Over an almost 30 year career in film and television, I have documented various aspects of the Northern Ireland conflict. From my earliest work, The Kickhams which looked at community life through the lens of the North Belfast Gaelic football team I played for as a boy, to my most recent film about IRA hunger striker Bobby Sands (66 Days), I have told the story of this place from a particular perspective for sure. That POV is, of course, coloured by my own personal experience but I have told these stories with clarity, honesty, and even-handedness. When I first saw Colin Davidson’s moving exhibition Silent Testimony, I realised I had a found the key to telling the largely untold story behind it on film. The story of the victims and survivors whose loss remains as visceral and raw today as it was when they first suffered loss many years ago. 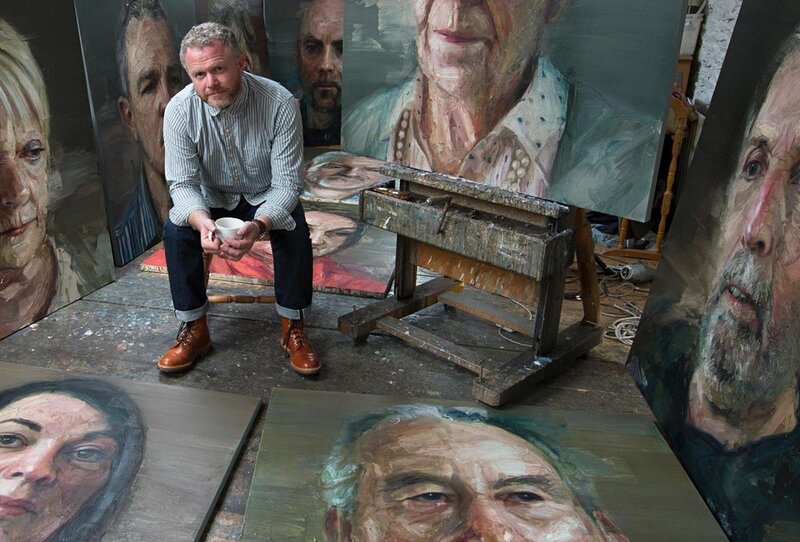 The portrait sitters in Davidson’s paintings comprise people from all walks of life, all religions, whose loved ones died on both sides of the Irish border and in the streets of the United Kingdom. There was no hierarchy in their suffering, just a powerful universal expression of human loss. On seeing the paintings, I realised I could make a film that used them as the core visual thread of the film and therefore be a cinematic exploration of the stories rather than something more televisual in feel. The audience would be forced to look into the eyes of the people, confronting them to consider the depth and nuances of each of their stories. I chose not to film interviews with our contributors, as I did not want to distract the audience with any differences between the real faces and the painted faces. Rather we would simply hear their voice as we looked at how the artist depicted each of them in his paintings. HEAR MY VOICE would be the story of the people featured in the exhibition rather than the story of the exhibition itself. It would be a filmic companion to Silent Testimony. 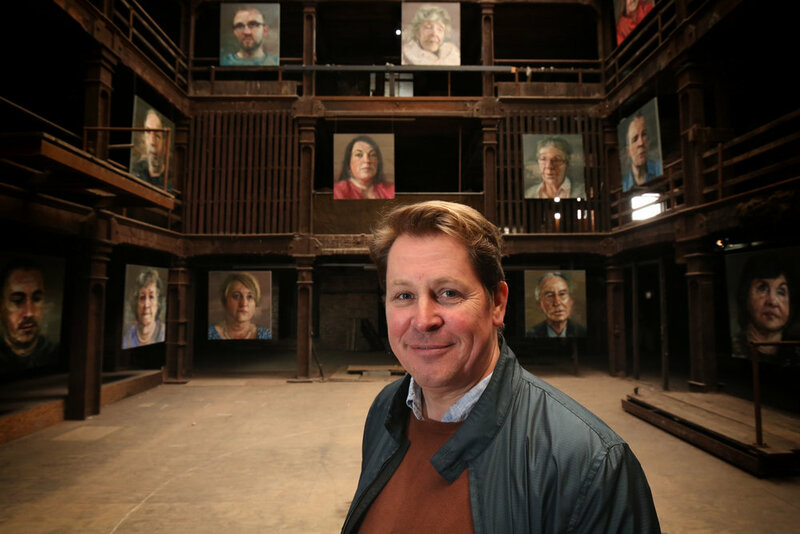 When I approached the artist behind Silent Testimony about the idea, Colin was very open to the idea of collaboration but equally apprehensive that any film would do justice to the paintings and the ethos behind the exhibition. Thus began a long conversation. We both understood the limitations that exist in trying to capture something unique in a traditional art gallery setting - the uniform nature of the lighting, traditional wall hanging with no depth of background and the complications of bringing state of the art filming equipment into a working gallery. Furthermore, the exhibition was not actually hanging when we started production. We both knew of an old, now derelict ironworks factory in central Belfast that had been used for some filming. ‘Let’s hang the exhibition there’ we thought. RT @colin_davidson: @irishmissionun @UlsterMuseum @WAVETrauma @UKUN_NewYork Thank you all. It has been a privilege. If you would like to contact us concerning the film, please fill in the form below.